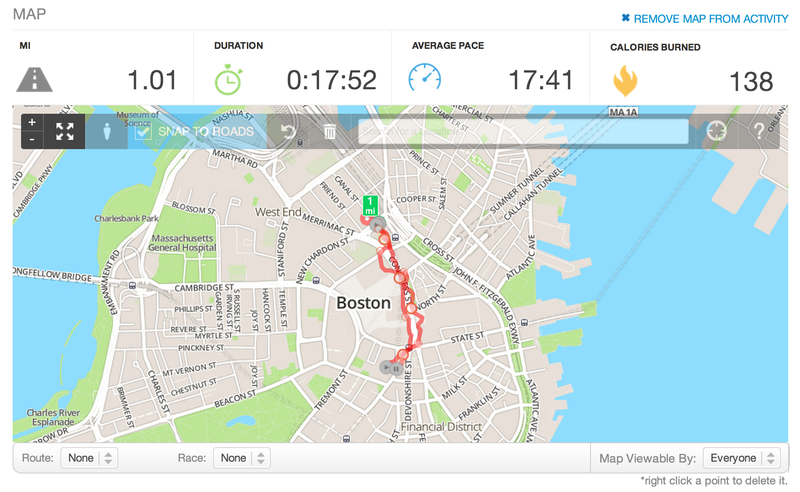 To edit an activity map, head to runkeeper.com, sign into your Runkeeper account, then click on the Me Tab in the upper navigation bar. Then in the submenu, select Activities, then navigate to the activity you would like to edit. In the upper right hand corner of that activity select the "v" to reveal a dropdown menu. Once you select Edit on the activity page, the initial map display will only show a select number of GPS points, with many more hidden along your activity trip's line. Simply zoom-in as far you'd like using the zoom buttons on the top left of the map, to discover more (or less) GPS points of your trip. Once on a comfortable zoom setting, you can move the trip points to adjust the trip lines. You can use the "Snap to Roads" selection to make sure your trip lines snap to the roads of your trip. If your trip was cut short for some reason you can click anywhere past your end point to add additional trip points to your activity. There are a few things to note about deleting GPS points. First off, GPS points store elevation data, so don't delete them (unless you don't mind losing data)! Secondly, when you delete a visible point, you delete all the GPS points between it and the nearest visible point on the left and right. If you still want to delete a GPS point, simply right click on the point!